Do Christians Go Immediately to Heaven After They Die? Where do Christians go the moment after they die? Is it immediately to heaven and for the unsaved, immediately to hell? Does the Bible say where the dead go and when? What happens in the very next second or less after a person dies? The destination clearly depends upon whether a person has repented and trusted in Christ or whether they have rejected their only hope of eternal life (Acts 4:12; 16:30-31). Paul seemed certain that after he died he would be present with the Lord. To be present with someone obviously means that they would have to be with them. When I got married, my fiancé had to be present with me or we could not have gotten married. I know that is a poor analogy but what I am saying is that Paul says to be absent from the body (dead) is in the next moment to be “present with the Lord.” In 2 Corinthians 5:6, 8 Paul wrote that, “We know that while we are at home in the body we are away from the Lord…and we would rather be away from the body and at home with the Lord.” I see nowhere in this text where there is a time differential between death and being in the presence of the Lord. For those who bend the knee, repent of their sins, confess their sinfulness and desperate need for the Savior, and then put their trust in Him, there is a joyous destination awaiting you. When Paul wrote his letter to Timothy he understood that the time of his death was near. Whether he had overheard this from the guards, an angel of the Lord or Jesus Christ Himself we cannot tell but Paul seemed certain that he was going to die very soon. It’s important to note that the books of the Bible are not in the order in which they were written…that is, they are not in chronological order. This is true of the Old Testament as well as the New Testament. There are many books in the Bible that are in the order in which they were written, but certainly not all of them and so when we see that 2 Timothy is followed by Titus and Philemon, which were also written by Paul, this doesn’t mean that they were written after 2 Timothy. Most Bible scholars believe 2 Timothy was Paul’s last letter and this may be why he is giving Timothy departing letter. When Jesus mentioned what happened to the rich man and Lazarus after they died, there was no mention of a holding period or an interval of time between their death and their destination. Lazarus lived in poverty and want while the rich man lived in splendor and plenty but when they died, they went separate ways. There is no mention of the false idea of a “soul sleep.” When the Bible mentions that they slept with their fathers or they had fallen asleep, that meant that they were dead…but not gone (John 11:1-14). Two important things are in this story. One is “when they died.” What happened when they died? The rich man went to “Hades, where he was in torment” while Lazarus was carried by angels to Abraham’s bosom. The place that Lazarus was at seems to be what is called in the Jewish vernacular, “Paradise.” Paradise is thought to be the abode or dwelling place of the Old Testament saints. Jesus told the thief on the cross, “Truly I say to you. Today you will be with me in Paradise” (Luke 223:43). Any time Jesus says “truly” or “surely” as some translations say, you can be certain that Jesus was putting an exclamation point on what He was saying. Jesus said surely or truly the thief would be with Jesus in Paradise. When would the thief be in Paradise and when? It would be “today” and he would be with Jesus. That very day Jesus promised the thief would be with Him in paradise. After Jesus’ death, Paradise may have been changed into being in the presence of the Lord or in heaven because of the atoning work at Calvary so that the Old Testament saints and those who died in the faith will be present with the Lord (2 Tim 4:6-8). Another related reading: What Does The Bible Say Heaven is Like? When Stephen was stoned for proclaiming the gospel, he sees the Lord, Jesus Christ standing at the right hand of God in heaven. Again, there is no mention of soul sleep. As Stephen was dying, he actually saw heaven open up and there was “the Son of Man (Jesus) standing at the right hand of God.” Stephen must have known that he was going immediately into the presence of the Lord for he says “Lord Jesus, receive my spirit.” Here is a dying Stephen, seeing Jesus in heaven and asking him to receive his spirit.” That sounds like he is immediately being “absent from the body” only to be “present with the Lord” (2 Cor 5:6). How clear that is. If you are not born again, then you will have no opportunity to go to heaven when you die but will the very next moment be in torment. You will wait in torment, like the rich man is still waiting today. You will await the Great White Throne Judgment where all who are in their graves and those unbelievers still living at the time of Christ’s return will be judged (Rev 20:11-15) but God has provided a way for you to be redeemed. For those who bend the knee, repent of their sins, confess their sinfulness and desperate need for the Savior, and then put their trust in Him, there is a joyous destination awaiting you. 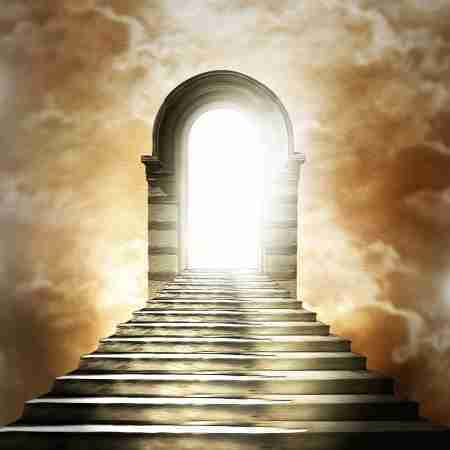 That is where you’ll be one second after you die…that is if you are born again. A person that’s born twice (born again and a natural birth) will never die but a person who is born only once (a natural birth but not born again) will die twice; once in their mortal body and then in the lake of fire (Rev 20:11-15). I pray you choose the former. Related Post: Where Is Heaven? Where Is Hell? Does The Bible Say? 2 Cor. 5:1-8 is even more revealing than you have noted. The question must be asked here “What part of us has an earthly home and desires a heavenly if we cease to exist at death and all we are is a body?” Clearly, “we” continue to exist after the earthly body dies.